English Bridge Education & Development is a relatively new charity. We want more people of all ages to enjoy playing bridge, and specifically duplicate bridge. Our efforts will go into encouraging more people to take up bridge, as well as building the infrastructure which will make that aim a reality. All donations we receive will go towards this - making sure this fascinating and absorbing game has a strong future. We need your help to promote bridge in our communities: to encourage young and old to take up the game, with important benefits for cognitive skills and social inclusion. Funding for our education programmes depends upon donations from people just like you. 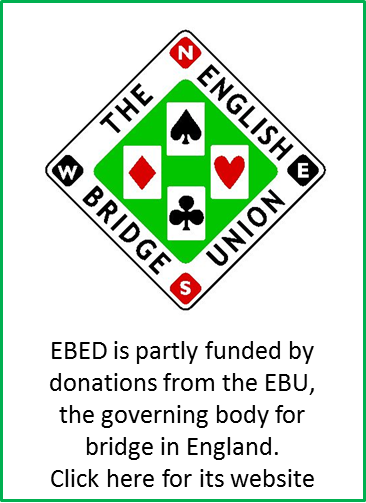 EBED are pleased to be involved with ground-breaking research into the health and wellbeing benefits of playing bridge. We have partnered with academics at Stirling University to undertake a number of projects, aimed at investigating ‘brain health’ and finding ways of supporting ‘healthy ageing’ through promoting cognitive activities such as playing bridge. More information on the work to date, and our future projects, is available here. Whilst EBED is making a significant financial investment in the undertaking of these projects, and volunteers are giving their time and energy to driving the projects forward, more assistance is needed. We hope you will be willing to make a donation to help us carry out future stages of our work and ensure they are completed to optimum effect. Make your gift more efficient. Help ensure the future of Bridge. You can also, if you prefer, download a donation form and post us a cheque. Please feel free to call 01296 317 218 at any time to discuss further gifting options.. If there are any changes to the amount, date or frequency of your Direct Debit, English Bridge Education & Development will notify you 10 working days in advance of your account being debited or as otherwise agreed. If you request English Bridge Education & Development to collect a payment, confirmation of the amount and date will be given to you at the time of the request. If an error is made in the payment of your Direct Debit by English Bridge Education & Development or your bank or building society you are entitled to a full and immediate refund of the amount paid from your bank or building society. If you receive a refund you are not entitled to, you must pay it back when English Bridge Education & Development asks you to.